Nitric acid/Kerosene propellant. This propellant combination, theoreticaly a very low-cost solution, proved to have ignition and stability problems. Finally the addition of approximately 40 per cent of UDMH to JP-4 resulted in a formulation (JP-X) which solved both the combustion and the ignition difficulties experienced with WFNA/ JP-4 and IRFNA/JP-4. However by then N2O4/UDMH was settled on as the optimum storable propellant combination. Specific impulse: 314 s. Specific impulse sea level: 268 s. Location: 1610. Propellant Formulation: IRFNA/RP-1. Optimum Oxidizer to Fuel Ratio: 4.8. Temperature of Combustion: 3,235 deg K. Ratio of Specific Heats: 1.23. Density: 1.35 g/cc. Characteristic velocity c: 1,610 m/s (5,280 ft/sec). Isp Shifting: 268 sec. Isp Frozen: 258 sec. Mol: 25.00 M (82.00 ft). Oxidizer Density: 1.510 g/cc. Oxidizer Freezing Point: -42 deg C. Oxidizer Boiling Point: 86 deg C. Fuel Density: 0.806 g/cc. Fuel Freezing Point: -73 deg C. Fuel Boiling Point: 147 deg C.
BI-1 Russian manned rocketplane. Flown 1941. The Bereznyak-Isayev BI-1 was the first high speed rocket plane developed by the Soviet Union. Drawings were completed by spring 1941 but Stalin did not give the go-ahead for production until July 9, 1941. Buran M-41 Nitric acid/Kerosene propellant rocket stage. Booster for Buran missile. Four used to boost ramjet second stage to ignition conditions. Masses estimated based on missile known total mass. Specific impulse estimated. DF-2-1 Nitric acid/kerosene rocket stage. 300.00 kN (67,443 lbf) thrust. Mass 30,000 kg (66,139 lb). DF-2A-1 Nitric acid/kerosene rocket stage. 300.00 kN (67,443 lbf) thrust. Mass 30,000 kg (66,139 lb). Hwasong 5 stage Nitric acid/Kerosene propellant rocket stage. Hwasong 6 stage Nitric acid/Kerosene propellant rocket stage. I-270 Russian manned rocketplane. Flown 1947. The MiG I-270 rocketplane began as a post-war copy of the German Ju-248 (Me-263) design. The resulting rocketplane had a more refined aerodynamic form than the Me-263 and lower gross weight. Isayev R-17 Isayev Nitric acid/Kerosene rocket engine. R-17. Out of production. Designation unknown. First flight 1961. Kosmos A-1 Nitric acid/Kerosene propellant rocket stage. .
R-11 stage Nitric acid/Kerosene propellant rocket stage. First Russian ballistic missile using storable propellants. Enlargement/elaboration of German Wasserfall SAM. Developed by Korolev OKB, then Makeyev OKB spun off to develop Army and SLBM derivatives. Range 270 km with 690 kg, accuracy 1.5 km/0.75 km. Maximum altitude 78 km. Time of flight 5.4 minutes. Max velocity at burnout 1430 m/s. Source: Wall chart, Russian Space Agency HQ, Moscow. R-11FM stage Nitric acid/Kerosene propellant rocket stage. First Russian submarine-launched ballistic missile. Range 150 km with 967 kg warhead. Accuracy 1.5 km in range, 0.75 km lateral. R-17 stage Russian nitric acid/kerosene propellant tactical missile. The final refinement of the R-11 design, the R-17, was exported widely and became infamous around the world by its ASCC reporting name - "Scud". It was perhaps the most famous ballistic missile of the post-war period due to its use in the Iran-Iraq 'War of the Cities' and the Gulf War. This was the definitive production version of what was essentially a storable-propellant rocket with the performance of the V-2. Copies and developments of the R-17 were undertaken in North Korea, Iraq, Syria, and Egypt. Using the calculations of Gerald Bull, R-17's were stretched and clustered as basis of the Tamouz Iraqi ICBM/satellite launch vehicle. R-56 Blok A Notional Nitric acid/Kerosene rocket engine. R-56 Blok A. Notional engines for polyblock R-56, immense booster/ICBM; planned range 16,000 km. payload 35,000 kg. TsNIIMash has 1:10 structural simulation model. R-56 Blok B Notional Nitric acid/Kerosene rocket engine. R-56 Blok B. Notional engines for polyblock R-56, immense booster/ICBM; planned range 16,000 km. payload 35,000 kg. TsNIIMash has 1:10 structural simulation model. R-56 Polyblock Stage A Nitric acid/Kerosene propellant rocket stage. Range 16,000 km. Payload 35,000 kg. TsNIIMash has 1:10 structural simulation model. Three stage carrier rocket with consecutively divided first and parallel divided second stages. Work began in 1961. Chief designer Yangel. Source: Placard, TsNIIMash. R-56 Polyblock Stage B Nitric acid/Kerosene propellant rocket stage. .
RD-1 Glushko Nitric acid/Kerosene rocket engine. Used for JATO take-off acceleration of Pe-2, La-7, Yak-3, Su-6 airplanes. Developed 1941-45. First Russian liquid propellant rocket engine. Production 1944-45. Ignition was by an ethane-air mixture. RD-1KhZ Glushko Nitric acid/Kerosene rocket engine. take-off acceleration of Pe-2R, La-7R, Yak-3, Su-6, Su-7, La-120R airplanes. Developed 1941-46. The RD-1KhZ was a variant of the RD-1 engine with chemical ignition. Production 1944-45. RD-2 Glushko Nitric acid/Kerosene rocket engine. experimental. Developed 1945-47. The RD-2 was based on the RD-1 engine. Used chemical ignition. RD-200 Glushko Nitric acid/Kerosene rocket engine. vertical sounding rocket. Developed -1951. RD-210 Glushko Nitric acid/Kerosene rocket engine. vertical sounding rocket. Developed -1954. RD-211 Glushko Nitric acid/Kerosene rocket engine. long-distance missile. Developed 1952-55. Original four-chamber engine design planned for use on the R-12 IRBM. Abandoned due to limited thrust and the RD-214 was developed in its place. RD-212 Glushko Nitric acid/Kerosene rocket engine. Developed 1952-56. Original four-chamber engine design planned for the booster stage of the Buran intercontinental ramjet missile. Abandoned due to limited thrust; RD-213 was developed instead. RD-213 Glushko Nitric acid/Kerosene rocket engine. Winged rocket M-40 (2). Development ended 1957. Two thrust levels. Ignition with propellant TG-02. Chamber pressure 233,8 / 46,6 bar. Specific impulse 223 / 231 sea level. RD-214 Glushko Nitric acid/Kerosene rocket engine. R-12, Kosmos 11K63 stage 1. Single turbopump driven by H2O2 gas generator feeding four fixed chambers. Ignition with propellant TG-02. First flight 1957. RD-2MZV Dushkin Nitric acid/Kerosene rocket engine. I-270. Developed 1944-47. Thrust variable 0.1-0.3 metric tons / 0.35-1.4 metric tons. RD-2MZV-F Dushkin Nitric acid/Kerosene rocket engine. Samolet 5. Developed 1946. RD-3 Glushko Nitric acid/Kerosene rocket engine. experimental. Developed 1950's. 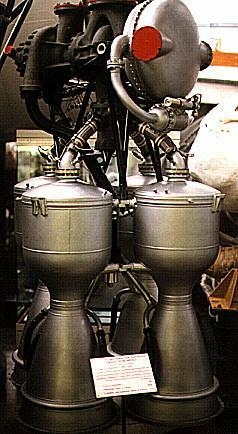 The RD-3 was a cluster of three RD-1 engines with a new common turbopump. Ignition was by an ethane-air mixture. RP-318 Russian manned rocketplane. Korolev adapted his SK-9 glider in 1936 as the first rocked-powered aircraft in the Soviet Union. S2.253 Isayev Nitric acid/Kerosene rocket engine. R-11 (Scud B) 8A61. Thrust 8300 kgf at sea level. Fuel Kerosene T-1, chemical ignition by TG-02. First flight 1953. S2.253A Isayev Nitric acid/Kerosene rocket engine. R-11FM. Out of Production. Used in R-11FM submarine version of Scud B. Fuel Kerosene T-1, chemical ignition by TG-02. Mixture ratio derived from tank content. 81 kN sea-level. S-3-20M5A Dushkin Nitric acid/Kerosene rocket engine. Samolyot 5 Russian manned rocketplane. Cancelled 1949. Bisnovat was assigned the project to develop an all-Soviet equivalent to the 346 supersonic rocketplane being developed by the German Roessing team in OKB-2. YF-1 CALT Nitric acid/kerosene rocket engine. YLR45-AJ-1 Aerojet Nitric acid/Kerosene rocket engine. B-47C ATO. Out of Production. Development begun August 1948. Turbojet engine bleed air drive for turbopump. Fixed internal acid tanks, regenerative cooling. Engines: RD-1KhZ, RD-2MZV, RD-2, RD-2MZV-F, YLR45AJ-3, YLR45-AJ-1, S2.253, RD-211, RD-212, S2.253A, RD-3, RD-214, RD-213, Isayev R-17, S-3-20M5A, R-56 Blok A, R-56 Blok B, RD-1, RD-200, RD-210, YF-1. Spacecraft: RP-318, BI-1, Malyutka, I-270, Samolyot 5. Stages: R-56 Polyblock Stage B, R-56 Polyblock Stage A, Buran M-41, R-11 stage, DF-2A-1, DF-2-1, Hwasong 5 stage, Hwasong 6 stage, Kosmos A-1, R-17 stage, R-11FM stage.